At Uptown Xpress, we help exceptional couples create lasting memories of their wedding reception! What makes you special? What is your Love Story? How can we incorporate what is unique about you into your wedding to create tailored, made-to-measure moments that you and your guests will remember for a lifetime! Remember, if you are looking for a DJ to simply play music at your wedding, we will not be a good fit. If you are looking for an MC and DJ to create memorable, fun, romantic moments at your wedding; If you are willing to put in a little bit of work with Stefan, we can create something truly special together! Once we are working together, we then spend as much time as it takes to plan your wedding reception and ceremony. Usually two meetings are planned during the planning process, one to go over big picture ideas and one for the details. Remember, a DJ is More Than Just Music! The Uptown Xpress team is a small one, with carefully chosen members to assist Stefan deliver “the best wedding ever!” This allows Stefan Jez to pinpoint your needs and wants and to provide you with a premier disc jockey service. Stefan Jez is the only Montreal Wedding DJ that offers a 100% Money-Back Guarantee for his services. Stefan Jez specializes in being a wedding Master of Ceremonies and DJ. 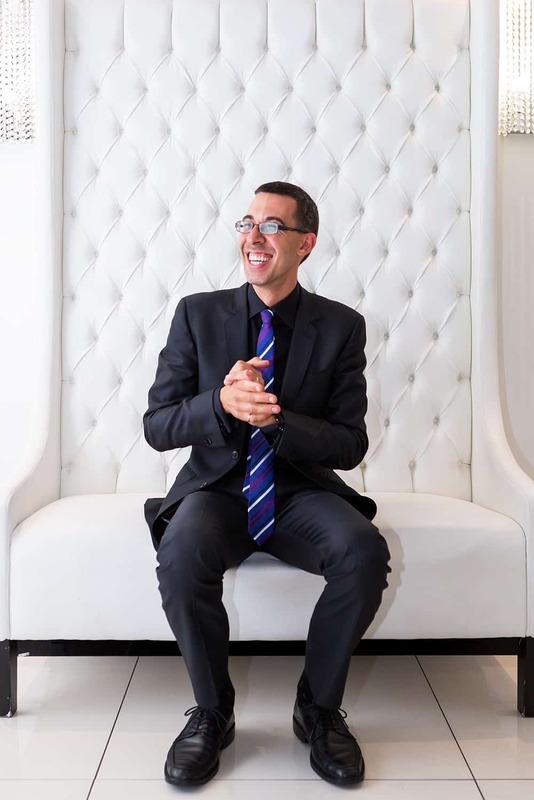 With over 20 years’ experience, Stefan’s goal is to create a unique wedding entertainment experience that truly represents you and evokes real emotion at your reception. Stefan Jez has taken a personal approach to mobile entertainment, combined with professionalism, honesty and enthusiasm, to give his clients an experience that truly makes them feel comfortable, excited and reassured about their event. Unlike many large mobile entertainment companies in Montreal, where you never actually meet your DJ or MC, at Uptown Xpress you always meet directly with Stefan Jez. Not only that, Stefan himself will be the DJ and MC at your wedding! From the first phone call and sit down meeting, you get to know Stefan before you make your decision. Always looking for ways to improve service, Stefan attends industry trade shows, seminars, training and performance workshops every year. Yes, these do exist! Stefan Jez is the only MC in Montreal to have completed the very sought after Marbecca Master of Ceremonies workshops: MC Bronze, MC Silver, MC Gold, Bronze Love Story, Silver Love Story. Stefan has also completed the Entertainment Experience workshop. In Montreal, where multi-cultural weddings are common, Stefan has experience with international weddings of all nationalities. Stefan is also a proud member of the Canadian Disc Jockey Association and is fully licensed and insured. Your wedding will be one of the most important days of your lives. You will be investing your time and resources into planning it. Without the right entertainment, all that effort can be wasted. Do not simply hope that your wedding will be a success. The entertainment at a wedding accounts for 80% of the success of the reception! The DJ you hire should be considered an investment and not just someone who will play music. Uptown Xpress is not your average wedding DJ, as such we do not charge an average fee. Our results are far above average, which means we charge well above the average – but the results are always extraordinary! Stefan Jez offers a premium, personalized disk jockey service with attention to every detail. Once working together, we then spend as much time as it takes to plan your wedding reception. Typically, there will be three meetings with Stefan. These are in-person (preferably), or can be done via Skype or FaceTime. The first is the consultation. The second meeting is usually a few months before your wedding, where we go over the grand ideas for the reception and take any recordings to be used in the Custom Audio Song Edit. Finally, about a month before your wedding, the third meeting is held, where all the details of the reception are discussed and organized. When it comes to wedding DJ’s in Montreal, there is one fact that many DJ’s do not want to accept. There is no such thing as a “good” fit for everyone. It’s true, which is why we freely admit that Uptown Xpress is NOT for everyone. Here at UPX, we know what drives us. We know where our strengths and weaknesses lie. We also know what a “good fit” and “bad fit” client looks like. A wedding reception is More Than Just Music! Coordination throughout the reception is also key, we help you plan your reception, when should the speeches be? When should the special dances be? Dancing or games during dinner? We then make sure everything runs smoothly so you can enjoy it without worries. Playing the right music, at the right time, is essential to creating the right mood. Having a real DJ that can “read the crowd”, take requests helps bring your party to a new level. A wedding reception needs a Master of Ceremonies to move the night along, to make your guests feel included and to connect all the moving parts of the evening together to create a true entertainment experience. We work with you to tell personalized introductions for all the special moments throughout your reception. Any DJ can make an announcement, we want to create memories at your wedding reception! We want to work with couples who want a truly unique experience at their wedding reception. We want your guests to say your wedding was the best they have ever been to, before the dancing even starts! By working closely with you, we guarantee that your wedding will be one of a kind. Clearly, there are many wedding DJ’s that will charge less than we do at UPX, as well they should. If you are basing your choice on price alone, please know we won’t be a good fit. If you do not think any of these things, and you want your wedding reception to be something unique and truly memorable for you and your guests, then we probably ARE a good fit for you and we should talk! Choosing the right wedding DJ can be difficult. There are so many to choose from in Montreal. Most people do not know what to expect from a professional wedding DJ. Many also do not know what to expect when it comes to pricing for a wedding DJ. Read our Ultimate Guide to Wedding DJ Pricing in Montreal for help. Take the UPX Challenge! We promise that after a 60 minute consultation with Stefan, you will see the value of what creating a unique entertainment experience will bring. If we are not a good fit, we promise that you will be prepared with the knowledge to go out and find the right DJ for you. Using the points covered in our meeting, you will be prepared to ask the right questions to other DJ’s. They might be surprised by them, but you will be able to make a much better decision! You have nothing to lose, schedule a stress-free consultation with Stefan today by texting or calling 514-297-3508.